The fate of 15-year old Dominik from Radenthein in Austria is quite moving. On his first working day of his apprenticeship to become a cook, a little over a year ago, Dominik had a serious accident that changed his life forever. Now Dominik is bound to a wheelchair, he is tube fed, can’t speak and needs round-the-clock care. He now has to work hard to learn the simplest things again in small steps. The situation is a great burden for the whole family, not just mentally and physically, but also financially. Expensive therapies and a disabled-friendly conversation of the house are necessary in order to provide Dominik the support he needs. Touched by this story, the Wenatex sales agent, Ingeborg Fritzer, got the stone rolling in October and triggered a chain of helpfulness. Together with other sleep advisors and Wenatex employees, Ingeborg was able to collect a sum of 1000 Euros for the family. 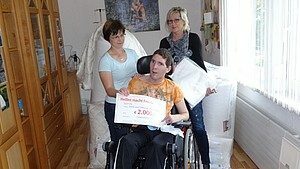 The Wenatex management doubled this sum and also provided a mattress, duvet, pillow and AquaStop protectors for Dominik.The check for 2000 Euros for special therapies that are not paid for by the insurance and the new Wenatex bed were handed over in November. Wenatex also had another surprise in store for Dominik’s mother, who does most of the nursing herself. She was also given a new Wenatex mattress so that she is able to get the restful sleep she needs so that she has enough energy to devote herself to her son.